Naftin® Gel, 1% contains the synthetic, broad-spectrum, antifungal agent naftifine hydrochloride. Naftin® Gel, 1% is for topical use only. 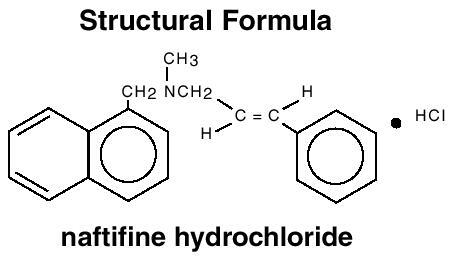 Naftifine hydrochloride has an empirical formula of C21H21NHCl and a molecular weight of 323.86.
polysorbate 80, carbomer 934P, diisopropanolamine, edetate disodium, alcohol (52%v/v) and purified water. Naftifine hydrochloride is a synthetic allylamine derivative. The following in vitro data are available, but their clinical significance is unknown. Naftifine hydrochloride has been shown to exhibit fungicidal activity in vitro against a broad spectrum of organisms, including Trichophyton rubrum, Trichophyton mentagrophytes, Trichophyton tonsurans, Epidermophyton floccosum, Microsporum canis, Microsporum audouini, and Microsporum gypseum; and fungistatic activity against Candida species, including Candida albicans. Naftin® Gel, 1% has only been shown to be clinically effective against the disease entities listed in the INDICATIONS AND USAGE section. Although the exact mechanism of action against fungi is not known, naftifine hydrochloride appears to interfere with sterol biosynthesis by inhibiting the enzyme squalene 2, 3-epoxidase. This inhibition of enzyme activity results in decreased amounts of sterols, especially ergosterol, and a corresponding accumulation of squalene in the cells. Following single topical applications of 3H-labeled naftifine gel 1% to the skin of healthy subjects, up to 4.2% of the applied dose was absorbed. Naftifine and/or its metabolites are excreted via the urine and feces with a half-life of approximately two to three days. • Efficacy for this organism in this organ system was studied in fewer than 10 infections. Naftin® Gel, 1% is contraindicated in individuals who have shown hypersensitivity to any of its components. Naftin® Gel, 1% is for topical use only and not for ophthalmic use. Naftin® Gel, 1% is for external use only. If irritation or sensitivity develops with the use of Naftin® Gel, 1%, treatment should be discontinued and appropriate therapy instituted. Diagnosis of the disease should be confirmed either by direct microscopic examination of a mounting of infected tissue in a solution of potassium hydroxide or by culture on an appropriate medium. Avoid the use of occlusive dressings or wrappings unless otherwise directed by the physician. Keep Naftin® Gel, 1% away from the eyes, nose, mouth and other mucous membranes. Long-term studies to evaluate the carcinogenic potential of Naftin® Gel, 1% have not been performed. In vitro and animal studies have not demonstrated any mutagenic effect or effect on fertility. Reproduction studies have been performed in rats and rabbits (via oral administration) at doses 150 times or more than the topical human dose and have revealed no evidence of impaired fertility or harm to the fetus due to naftifine. There are, however, no adequate and well-controlled studies in pregnant women. Because animal reproduction studies are not always predictive of human response, this drug should be used during pregnancy only if clearly needed. It is not known whether this drug is excreted in human milk. Because many drugs are excreted in human milk, caution should be exercised when Naftin® Gel, 1% is administered to a nursing woman. During clinical trials with Naftin® Gel, 1%, the incidence of adverse reactions was as follows: burning/stinging (5.0%), itching (1.0%), erythema (0.5%), rash (0.5%), skin tenderness (0.5%). A sufficient quantity of Naftin® Gel, 1% should be gently massaged into the affected and surrounding skin areas twice a day in the morning and evening. The hands should be washed after application. If no clinical improvement is seen after four weeks of treatment with Naftin® Gel, 1%, the patient should be re-evaluated. Note: Store at room temperature. Rev 2/09 Printed in U.S.A.